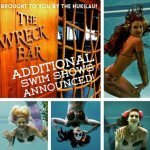 The Hukilau announces more news as the June 10-14 Tiki weekender approaches, including the sellout of the Tiki Tower Takeover. Beachbum Berry’s Latitude 29 is named one of the Best Bars in America, plus we have details on the sinking of an Easter Island-styled reef off South Florida. Other news includes keeping alive the memory of Florida’s Tiki Gardens and The Kahiki in Columbus, Ohio. 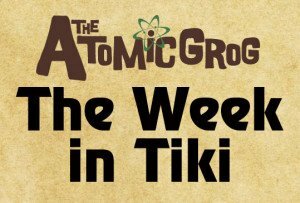 Weekly features spotlight artist Bamboo Ben, leading mug manufacturer Tiki Farm, Surf Rock Radio, and The Wreck Bar on Fort Lauderdale Beach. 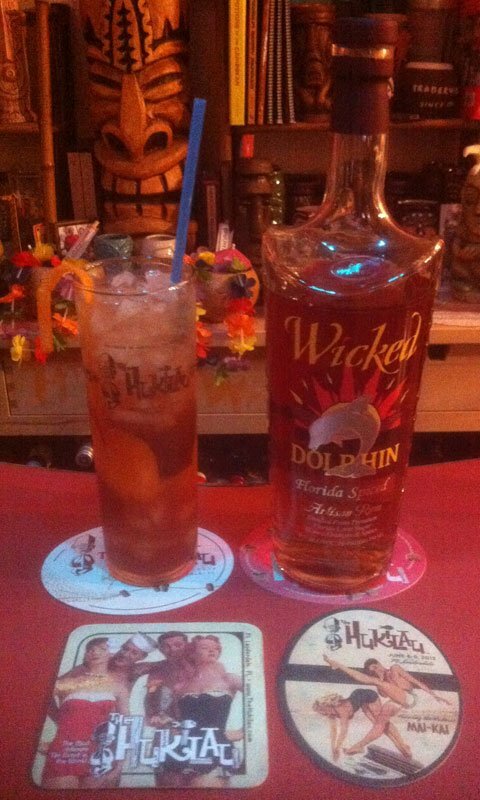 The rum of the week, Wicked Dolphin Florida Spiced, is featured in Martin Cate’s Henry & John cocktail. The Tiki Tower Takeover takes place in the Pier 66 hotel’s 17th floor rotating lounge, which was built in 1965 with a space-age design. It’s less than two weeks until The Hukilau, the East Coast’s largest and most authentic Tiki event, hits Fort Lauderale for its June 10-14 gathering, and tickets to many events are selling fast. The first to sell out is the Tiki Tower Takeover, the much-anticipated event featuring the country’s most celebrated Tiki bar owners and drink masters hosting a special cocktail party in the famous Pier 66 revolving lounge 17 floors above Fort Lauderdale Beach. Several hundred lucky attendees will be treated to new signature cocktails from Paul McGee (Lost Lake, Chicago), Martin Cate (Smuggler’s Cove, San Francisco), Jeff “Beachbum” Berry (Latitude 29, New Orleans), and Brian Miller (Tiki Mondays With Miller, New York City). Click here for more on the guest bartenders. Tickets remain for The Hukilau’s other signature event, the “Three Hour Tour” cruise with Dawn Wells, better known as Mary Ann on the classic TV show Gilligan’s Island. Guests will join everyone’s favorite castaway on Friday, June 12, aboard the Lady Windridge Yacht for a tour of the waterways of Fort Lauderdale. There will be an open bar featuring craft Tiki cocktails and food, plus a costume contest with a $100 grand prize. Wells will help select the best Gilligan’s Island-themed costume. Tickets are $99 for attendees with a wristband, $149 without a wristband. The five-day Big Kahuna pass is sold out, but you can still order four-, three-, and single-day passes, plus tickets to six expert symposiums and Marina the Fire Eating Mermaid’s two special swim shows at the B Ocean Resort. Some of these may not last long, so act now. Sponsor Rhum Barbancourt will have a major presence at The Hukilau 2015. 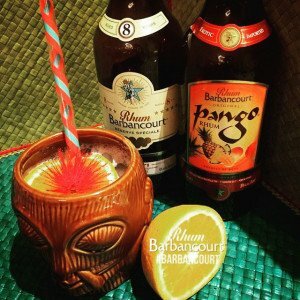 The Hukilau has six rum sponsors lined up for 2015, more than any other year, including the acclaimed Rhum Barbancourt from Haiti. Organizer Christie “Tiki Kiliki” White has released more details about the participation of Rhum Barbancourt: On Wednesday, there will be giveaways plus a special cocktail available during the Pre-Party in The Molokai lounge at The Mai-Kai. On Thursday, look for giveaways during the Tiki Tower Takeover, plus Rhum Barbancourt will be featured in Martin Cate’s cocktail. Free tastings will be offered in the Tiki Treasures Bazaar on Thursday (6-9 p.m.), Friday (4-7 p.m.) and Saturday (1:30-3 p.m.). Beachbum Berry’s symposium on the Planter’s Punch and the “Three Hour Tour” cruise with Dawn Wells will include cocktails featuring the distinctive rum. Also scheduled are more giveaways plus The Mai-Kai’s new Barbancourt cocktail on Saturday during the main event’s happy hours. Blue Chair Bay was also added to the roster of rum sponsors, joining previously announced Wicked Dolphin, Gubba, The Real McCoy, and Fwaygo. In other news, The Hukilai and the Hyatt Regency Pier 66 have extended the special $129 room rate for guests of The Hukilau until Monday night at 11:59 p.m. You must book through the link on TheHukilau.com to get the lower rate. Barely six months old, Beachbum Berry’s Latitude 29 in New Orleans has already been given the high honor of being named to Esquire magazine’s annual list of the Best Bars in America. Way back in 1998, Jeff Berry, a Los Angeles screenwriter, and his wife, Annene Kaye, a music journalist, published a spiral-bound book titled Beachbum Berry’s Grog Log. 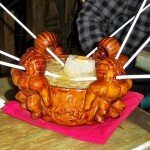 That was the beginning of the modern Tiki movement, if we can call it that. Rum drinks, Hawaiian shirts, tribal tattoos, rumaki. As “the Bum,” Berry was the movement’s figurehead and official historian. 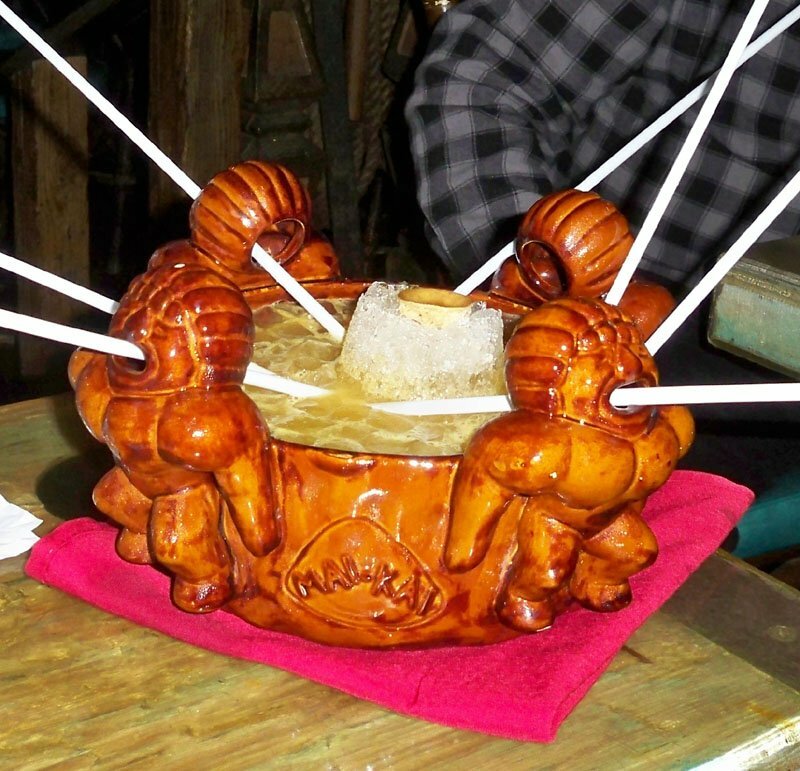 After writing several more books – culminating in the magisterial (and amusing) Potions of the Caribbean, which details the Tiki drink’s ultimate inspirations – and left without historical worlds to conquer, in late 2014 Berry took the leap from theory to practice, and he and Kaye opened a bar. Latitude 29 isn’t the fanciest or most eye-popping Tiki bar out there, but damned if the drinks aren’t the best of their kind. Wondrich’s annual list, while entirely subjective, is amazing in its depth and breadth. He honors everything from the smallest dive bar to the swankiest hotel lounge. The common thread: They’re very good at what they do. The Best Bars in America list has inspired a TV series of the same name on the Esquire Network hosted by comedians Jay Larson and Sean Patton, with occasional appearances by the curmudgeonly Wondrich. 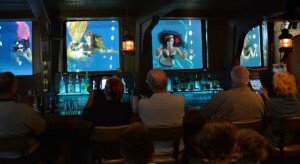 Since first airing in December 2013, the show has made it a habit of hitting Tiki hotspots, including Smuggler’s Cove, Three Dots and a Dash [Video], and Psycho Suzi’s Motor Lounge [Video]. Don’t miss: Beachbum Berry will return for his 10th appearance at The Hukilau in June, participating in several signature events: The sold-out Tiki Tower Takeover on June 11, and the symposium “Brigands, Barons & Beachcombers: The Many Faces of Planter’s Punch,” co-hosted with Brian Miller on Saturday, June 13. The in-depth look at the classic Caribbean cocktail will include several signature drinks. Tickets are available now for $55. 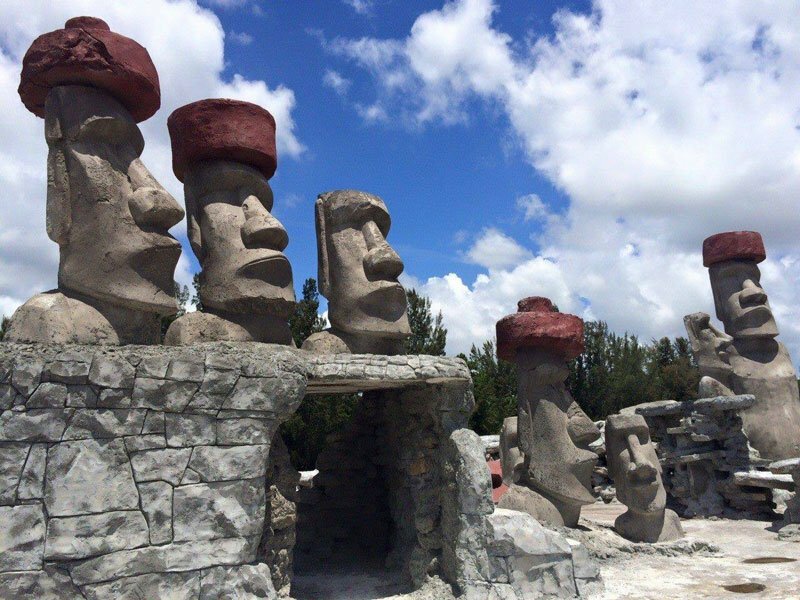 The 14 moai ranging from 6 to 22 feet will sit on concrete structures organized to encourage marine life to grow. The sculpture will be sunk on a 150-foot long barge in 70 feet of water off the Deerfield Beach International Fishing Pier. Conditions permitting, the barge will be sunk at 11 a.m. on June 7. Public viewing and related events will be held at the nearby 2 Georges at the Cove restaurant on Friday and Saturday, June 5-6. The barge will take a 60-mile voyage along the Intracoastal Waterway from Stuart, where the sculptures were created, to Deerfield Beach on Thursday and Friday, June 4-5. Click here to follow the journey and find out the exact time it will pass locations along the Intracoastal Waterway. The new Rapa Nui Reef website has detailed information on the project, including lots of photos and video. There’s also background on the iconic Easter Island moai that inspired the project. The sculptures were created by artist Dennis MacDonald, who has done work for Universal Studios, Sea World, and various museums. The project was envisioned and funded by Boca Raton philanthropist Margaret Blume. 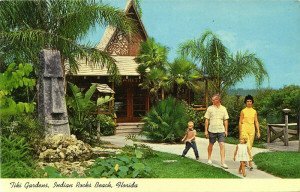 A vintage Tiki Gardens postcard. 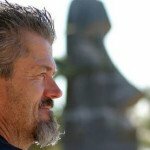 The Roadside Attraction vintage store in Largo, on Florida’s Gulf Coast, is hosting a special presentation on Sunday, May 31: “Speakeasy Sunday: Tiki Gardens with Jon Bortles.” Bortles will show slides and share stories about Tiki Gardens, the lost roadside attraction in nearby Indian Shores. For $20, you also get live music and refreshments. Seating is limited, so guests should RSVP on the Facebook event. The Polynesian theme park opened in 1964 and closed in the 1980s. Pinellas County bought the property from a developer and turned it into a public beach access parking lot. 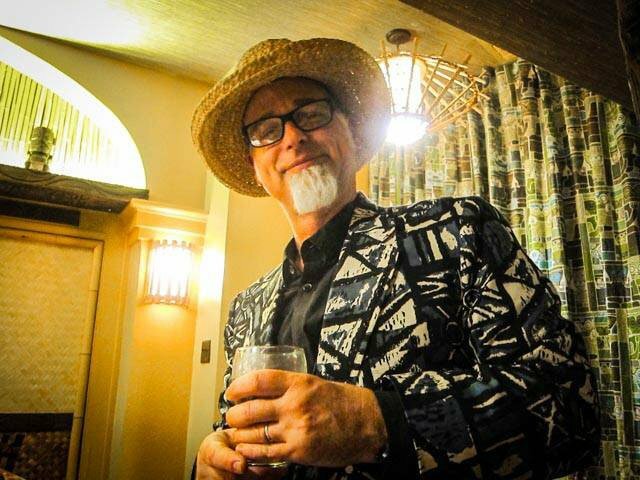 Don’t miss: Bortles and Scott Honour (aka Tiki Gardener) will present the symposium “They Paved Paradise and Put Up a Parking Lot: The Story of Tiki Gardens” at The Hukilau in Fort Lauderdale on Friday, June 12. 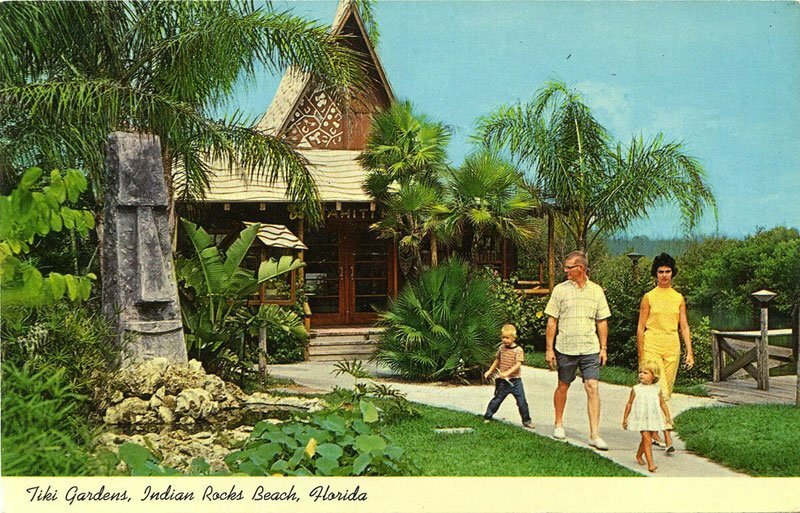 The Tiki archaeologists, who are writing a book about the vintage attraction, will present a slideshow and inside look at the location’s history. Tickets are available now for $25. A new restaurant is resurrecting some tastes of The Kahiki, the beloved Polynesian palace that loomed large in Columbus, Ohio, from 1961 until its closing in 2000. Tai Tiki Polynesian Bar & Grill features upscale cuisine, “modern and older tiki drinks, including some of the old recipes from The Kahiki,” general manager T.J. Van Heyde told Columbus Business First. The owners, who also run Tai’s Asian Bistro in Columbus, are veterans of The Kahiki. A Columbus Underground story touts the Volcano, a large bowl for two to four people that dates back to The Kahiki. 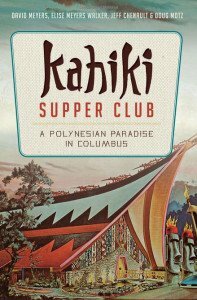 Don’t miss: Jeff Chenault, one of the authors of a new book on The Kahiki, will present the symposium “The Kahiki: Crown Jewel of Polynesian Supper Clubs” at The Hukilau in Fort Lauderdale on Sunday, June 14. The audio-visual history tour will include a vintage cocktail from The Kahiki menu. Tickets are available now for $25, including admission to the special finale at The Mai-Kai. The Caliente Tropics 50th anniversary mug (left) and Mark V mug, created for Tiki Caliente 2015, are still available. If you missed out on some of the exclusive merchandise at the seventh Tiki Caliente, held May 14-17 in Palm Springs, you’re in luck. The Mark V Deep Sea Diver mug and the Caliente Tropics 50th Anniversary mug are both still available online on the official website. Buyers can have them shipped or available for pick-up at the International Tiki Marketplace at Don the Beachcomber in Huntington Beach on June 13. The 50th anniversary mug is based on one of the original Tikis at the Caliente Tropics hotel, home of Tiki Caliente. The Mark V commemorates the 100th anniversary of the iconic diving helmet. Both were manufactured by Eekum Bookum. By all accounts, Retro Roadmap’s Vintage Wildwood Tiki Weekend was a smashing success. A. Panda’s Tiki Blog has a full report of the inaugural event with photos and a detailed rundown of all the fun festivities held May 15-17 at the historic Caribbean Motel on the south Jersey Shore. Celebrating the 1950s and early ’60s architecture and lifestyle, the event is poised to return in 2016. Tickets are now on sale for the ninth annual UK RumFest, set for Oct. 17-18 in London. Founded by global rum ambassador Ian Burrell in 2007, the festival features seminars, classes, cocktails, and tastings of more than 400 of the most diverse rums on the market. Top blenders, mixologists and distillers will also be on hand, along with the new Boutique RumFest, which will give advanced enthusiasts access to private tastings previously reserved only for those in the industry. Click here for ticket info. Ben Bassham, better known as Bamboo Ben, was destined to be a Tiki bar designer and builder. His grandfather, Eli Hedley, was a pioneer of the craft in Tiki’s mid-century heyday and obviously passed along a few genes. Ben is a master of giving a modern bar a vintage look and feel, and he’s famous for both his speed and attention to detail. Among his many projects are Forbidden Island (Alameda, Calif.), Frankie’s Tiki Room (Las Vegas), and Longitude (Oakland). In 2006, he helped restore the bar at the Kon Tiki in Tucson, which was originally built by his grandfather some 40 years earlier. Dave Cohen (aka Squid), and artist Josh Agle (aka Shag) soon joined the party with the first of his many mugs and an association that continues to this day. 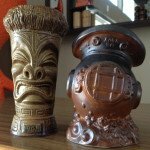 [See story] Soon thereafter, Tiki Farm and the Tiki revival took off, hand in hand, with most of the top aritsts contributing designs for mugs. In 2010, a 10th anniversary party and exhibit was held at La Luz De Jesus Gallery in Los Angeles featuring more than 2,000 different mugs, bowls, decanters, and other vessels on display from the company’s entire history to date. 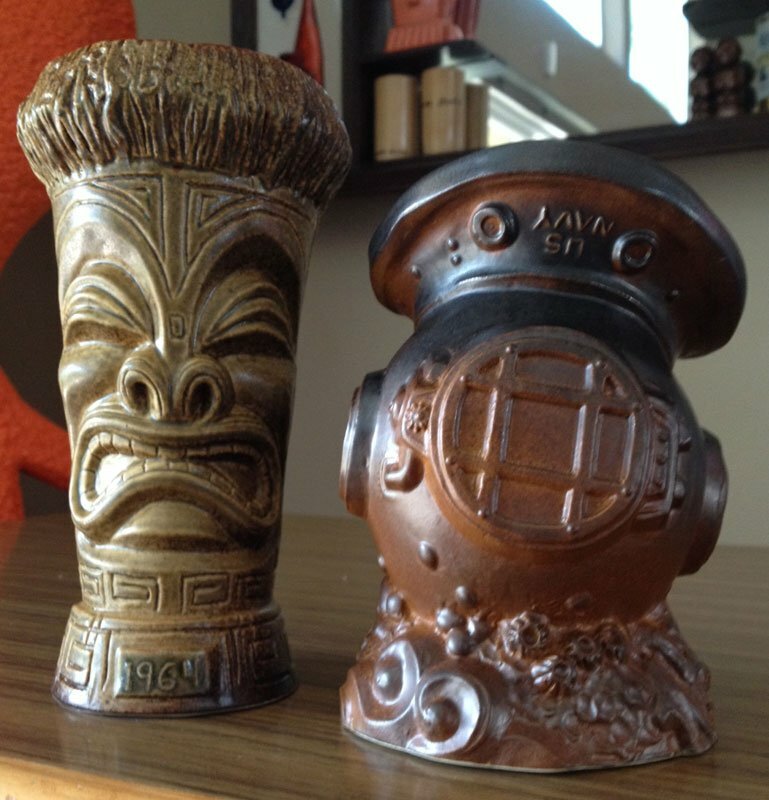 Since then, there have probably been another 1,000 designs added to the pantheon of Tiki Farm mugs, with clients ranging from Trader Sam’s in Disneyland and Disney World to The Mai-Kai in Fort Lauderdale to the smallest bars and events. Recent releases on the website include The Victor by Derek Yaniger, U’i Lani by Mookie Sato, and Savage Tiki by Thor. Westland is also a contributor to Tiki Magazine & More, where he reveals new designs and behind-the-scenes stories. The Wreck Bar offers not only tasty libations but one of the most scenic views. 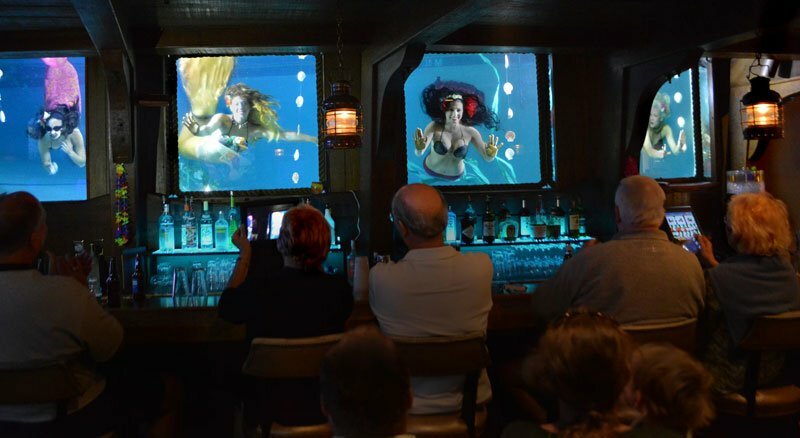 Known most notably over the past decade as the home of Marina the Fire Eating Mermaid, the nautical-themed bar in the B Ocean Resort on Fort Lauderdale Beach has a rich and storied history. Originally known (and still referred to by many) as the Yankee Clipper, the hotel opened in 1956 with its iconic “V” shape design, meant to look like an ocean liner. Much has changed in 58 years as the hotel has changed hands and undergone multiple refurbishments, but the Wreck Bar remains a throwback to the mid-century with portholes behind the bar offering clear views of Marina and her fellow mermaids as they perform underwater swim shows in the hotel’s main pool every Friday and Saturday at 6:30 p.m. Inspired by classic underwater performers, Marina Duran-Anderson convinced the hotel to let her do her show starting in 2006 and has since become a modern institution. The bar had already gained fame over the years as the site of major movie shoots, including Where the Boys Are (1960) and Analyze This (1999) with Robert DeNiro and Billy Crystal [See video]. According to legend, baseball great Joe DiMaggio professed his love for Marilyn Monroe by carving their initials into the bar while training in Fort Lauderdale with the Yankees. Don’t expect craft cocktails, but the drinks are much improved, the food is better than most bar fare, and the ambiance is hard to beat. Get there early to grab a seat at the bar for the best view on weekends and catch happy hour, which starts at 5:30. 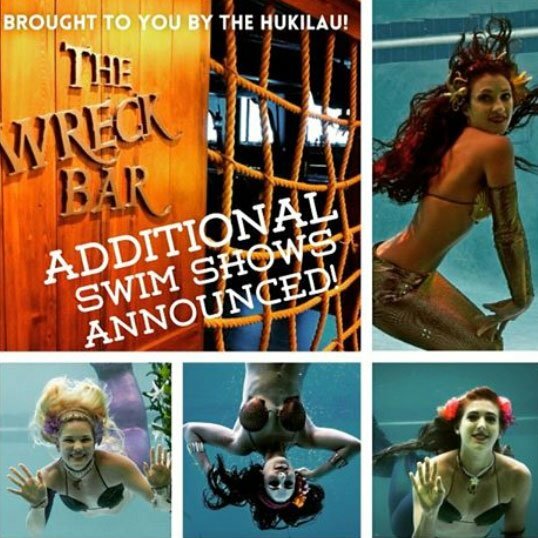 Don’t miss: Marina and her pod of aquaticats will perform two special swim shows for attendees of The Hukilau at 4:30 p.m. on Wednesday, June 10, and 2 p.m. on Saturday, June 13. The $10 tickets, which ensure attendees a good seat and clear views of the show, are selling fast so check availability at TheHukilau.com. The regular Friday and Saturday shows at 6:30 p.m. are free and open to the public. Its recommended you arrive early to avoid crowds during The Hukilau weekend. Instrumental surf music is difficult to find in most mainstream music outlets, even those dedicated to niche genres. Based in the United Kingdom, Surf Rock Radio fills this void with live steaming surf rock 24 hours a day via the website and music players that work on most major mobile devices. The site also includes charts of the most popular bands, songs, and albums, plus links to other notable surf music sites. Webcasting since June 2013, Surf Rock Radio still has lots of room to grow, so be sure to check it out and spread the word. Bands are encouraged to contibute songs and have their music heard. Spiced rums aren’t just for frat parties anymore. A new wave of artisan rums have been hitting the market lately, many in the spiced category. The Wicked Dolphin distillery in Cape Coral on Florida’s Gulf Coast prides itself in using local ingredients, and their Florida Spiced Artisan Rum is no exception. In addition to molasses from Florida sugar cane, this rum is full of fresh orange and honey, giving it a distinctive Sunshine State touch. Overall, the rum is drier and less sweet than a typical spiced rum. And at 80 proof, it also packs more heat than most spiced rums. Orange and vanilla/caramel dominate, with hints of honey and spices. 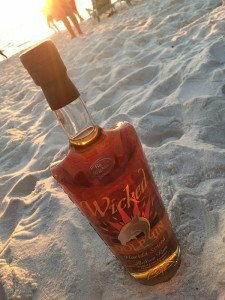 You can find Wicked Dolphin rums at 2,000 locations in Florida, plus South Carolina and Georgia. Coming June 1: Delaware and Washington, D.C.
Don’t miss: Wicked Dolphin will be pouring samples of its rums in the Tiki Treasures Bazaar at The Hukilau in Fort Lauderdale from Thursday, June 11, through Saturday, June 13. Shake all ingredients except soda water with ice. Strain into a Collins glass containing crushed ice and an orange peel. Top with soda and gently stir to combine. As spiced rum gains respect among spirits enthusiasts, it’s also being embraced by mixologists. One of the better spiced rum cocktails is this offering from Martin Cate. Perfect for the summer, it’s refreshing yet spicy, thanks to the rum and bitters. The sweetness is subtle and in perfect balance. A burst of orange hits you first, both in taste and aroma. 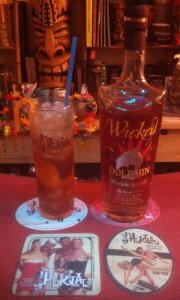 Considering its orange overtones, Wicked Dolphin Florida Spiced rum is the perfect rum for this drink. The rum is spicy and not cloyingly sweet, just like this well-crafted drink. I discovered this recipe in a Wine Enthusiast article on spiced rum that’s worth a read. I’ve see variations that call for Demerara sugar syrup or molasses simple syrup instead of brown sugar. All work fine, but the brown sugar might be the least intrusive (and easiest) option. I simply made a “cold process” syrup by combining the sugar and water and shaking vigorously before chilling in the fridge. Upcoming: Martin Cate will be mixing up a new signature drink at The Hukilau in Fort Lauderdale on Thursday, June 11. Lucky attendees will meet him and fellow Tiki bar luminaries Jeff “Beachbum” Berry (Latitude 29, New Orleans), Paul McGee (Lost Lake, Chicago), and Brian Miller (Tiki Mondays With Miller, New York City) at the sold-out Tiki Tower Takeover in the 17th floor lounge of the historic Hyatt Regency Pier 66 hotel. * Aug. 7-8 – Hot Rod Hula Hop, Columbus, Ohio. * Aug. 8 – Surf Guitar 101 Convention, Garden Grove, Calif.
* Sept. 12 – California Rum Fest, San Francisco. * Dec. 4 – Midwest Rum Fest, Louisville, Ky.
* June 26-28 – Tiki Pop Fever, Saint-Tropez, France. This entry was posted in 2015, Art, Cocktails, Culture, Events, Events, Events, Events, History, Hukilau, Mai-Kai, Music, Other Florida, Recipes, Rum, South Florida, The Week in Tiki, Tiki mugs and tagged Bamboo Ben, Beachbum Berry, Brian Miller, cocktails, Dawn Wells, Eli Hedley, Fort Lauderdale, Henry & John, Hukilau, Ian Burrell, Latitude 29, Mai-Kai, Marina the Fire Eating Mermaid, Martin Cate, mermaids, Paul McGee, Pier 66, Rapa Nui Reef, recipe, Retro Roadmap, Rhum Barbancourt, Roadside Attraction, rum, South Florida, spiced rum, surf, Surf Rock Radio, The Kahiki, Tiki Caliente, Tiki Farm, Tiki Gardens, Tiki Tower Takeover, UK RumFest, Wicked Dolphin, Wildwood, Wreck Bar, Yankee Clipper. Bookmark the permalink.